Chinook spend 1 to 7 years at sea. The Chinook salmon is the largest of all Pacific salmon, typically measuring 36 inches in length, often exceeding 30 pounds. Adults are distinguished by the black irregular spotting on the back and dorsal fins and on both lobes of the caudal or tail fin. Chinook salmon also have a black pigment along the gum line, thus the name "blackmouth" in some areas. In the ocean, the Chinook salmon is a robust, deep-bodied fish with bluish-green coloration on the back which fades to a silvery color on the sides and white on the belly. Colors of spawning Chinook salmon in fresh water range from red to copper to deep gray, depending on location and degree of maturation. Males typically have more red coloration than females, which are typically gray. Older adult males (4-7 years) are distinguished by their "ridgeback" condition and by their hooked nose or upper jaw. Females are distinguished by a torpedo-shaped body, robust mid-section, and blunt noses. Juveniles in fresh water (fry) are recognized by well-developed parr marks which are bisected by the lateral line. Chinook salmon heading to the ocean (smolt) have bright, silver sides, and parr marks recede to mostly above the lateral line. Like all species of Pacific salmon, Chinook salmon are anadromous. They hatch in fresh water and rear in main-channel river areas for one year. The following spring, Chinook salmon turn into smolt and migrate to the salt water estuary. They then spend anywhere from 1-5 years feeding in the ocean, and return to spawn in fresh water. All Chinook salmon die after spawning. Chinook salmon may become sexually mature from their second through seventh year, and as a result, fish in any spawning run may vary greatly in size. For example, a mature 3-year-old will probably weigh less than 4 pounds, while a mature 7-year-old may exceed 50 pounds. Females tend to be older than males at maturity. In many spawning runs, males outnumber females in all but the 6- and 7-year age groups. Small Chinook salmon that mature after spending only one winter in the ocean are commonly referred to as "jacks," and are typically male. Alaska streams normally receive a single run of Chinook salmon in the period from May through July. Chinook salmon often make extensive freshwater spawning migrations to reach their home streams on some of the larger river systems. Yukon River spawners bound for the extreme headwaters in Yukon Territory, Canada, will travel more than 2,000 river miles during a 60-day period. Chinook salmon do not feed during the freshwater spawning migration, so their condition deteriorates gradually during the spawning run as they use stored body materials for energy and gonad development. Each female deposits between 3,000 and 14,000 eggs in several gravel nests, or redds, which she excavates in relatively deep, fast moving water. In Alaska, the eggs usually hatch in late winter or early spring, depending on time of spawning and water temperature. The newly hatched fish, called alevins, live in the gravel for several weeks until they gradually absorb the food in the attached yolk sac. These juveniles, called fry, wiggle up through the gravel by early spring. Chinook juveniles divide into two types: ocean type and stream type. Ocean type Chinook migrate to saltwater in their first year. Stream type spend one full year in fresh water before migrating to the ocean. In Alaska, most juvenile Chinook salmon remain in fresh water until the following spring when they migrate to the ocean as smolt in their second year of life. Juvenile Chinook salmon in fresh water initially feed on plankton and later feed on insects. In the ocean, they eat a variety of organisms including herring, pilchard, sandlance, squid, and crustaceans. Salmon grow rapidly in the ocean and often double their weight during a single summer season. Fresh water streams and estuaries provide important habitat for spawning chinook, and they also serve as nursery grounds for developing eggs, fry, and juveniles. 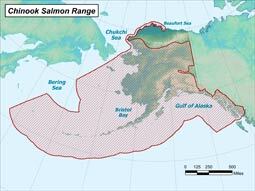 In North America, Chinook salmon range from the Monterey Bay area of California to the Chukchi Sea area of Alaska. On the Asian coast, Chinook salmon occur from the Anadyr River area of Siberia southward to Hokkaido, Japan. In Alaska, they are abundant from the southeastern panhandle to the Yukon River. Major populations return to the Yukon, Kuskokwim, Nushagak, Susitna, Kenai, Copper, Alsek, Taku, and Stikine rivers. Important runs also occur in many smaller streams. State Status: S4 (Apparently Secure – relatively uncommon but not rare. Some cause for long-term concern due to declines and other factors. Trends and Threats: There are numerous stocks of Chinook throughout the state and their population trends are just as diverse: Some stocks are in decline while others are at equilibrium or increasing. Threats include overfishing, dams, habitat loss, habitat degradation, and climate change. 3% of Chinook have white meat. The species name “tshawytscha” comes from the common name used among natives in Alaska and Siberia. Chinook are Alaska’s state fish. Chinook salmon are called “Kings” in reference to their large size. The longest known trip ever taken by a salmon was a Chinook salmon that traveled 3,845 km upstream to spawn. Pacific salmon returning to Alaska rivers and streams to reproduce are the basis for one of Alaska's most important industries. From 2000–2004, the average harvest of salmon sold by commercial fishermen in Alaska was almost 157 million fish (about 742 million pounds). North Pacific Chinook salmon catches during the late 1970s and early 1980s averaged more than 4 million fish per year. The United States harvested the majority of the catch followed by Canada, Japan, and the USSR. The annual Alaska harvest of Chinook salmon averaged 630,000 fish from 1970 to 2006. The majority of the Alaska catch is made in Southeast Alaska, Bristol Bay, and the Arctic-Yukon-Kuskokwim areas. Commercially-harvested Chinook salmon averaged approximately 18 pounds. The majority of the catch is made with troll gear and gillnets. There is an excellent market for Chinook salmon because of their large size and excellent table qualities. Recent catches in Alaska have brought fishers nearly $19 million per year. This fishery is defined as "the taking, attempting to take or possession of finfish, shellfish or aquatic plants by an individual Alaska for consumption as food or use as bait by that individual or his immediate family”. Only Alaska residents may participate in personal use fisheries. The Board of Fisheries established this fishery to allow Alaskan residents to harvest fish for food in areas that are not eligible for subsistence fisheries. Personal use fisheries are only allowed when they won't jeopardize sustained yield of the resource, and won't negatively impact an existing resource use, and are in the broad public interest. Personal use fishing is primarily managed by the Alaska Department of Fish and Game, Sport Fish Division, but some regional or area fisheries for various species of fish are managed by the Division of Commercial Fisheries. The Chinook salmon is perhaps the most highly prized sport fish in Alaska and is extensively fished by anglers in Southeast Alaska and in Cook Inlet (South-central Alaska). Trolling with rigged herring is the favored method of angling in salt water, while lures and salmon eggs are used by freshwater anglers. The annual Alaska sport fishing harvest of Chinook salmon from 1989 to 2006 averaged 170,000 fish. During that period, 60% of the sport fish harvest of Chinook salmon was taken in South-central Alaska, 26% in Southeast Alaska, and 4% in the Arctic-Yukon-Kuskokwim area. Alaska's sport and personal use fisheries worth more than 500 million dollars annually. Many Alaskans depend heavily on subsistence-caught salmon for food and cultural purposes. The Alaska Department of Fish and Game recognizes the definition of subsistence fishing to mean the taking of, fishing for, or possession of fish, shellfish, or other fisheries resources by a resident of the state for subsistence uses with gill net, seine, fish wheel, long line, or other means defined by the Board of Fisheries. Annual Chinook salmon harvests by subsistence and personal use fishers in Alaska averaged 167,000 fish from 1994 to 2005. The majority of the subsistence harvest is taken in the Yukon and Kuskokwim rivers. Research plays an important role in promoting an understanding of wildlife populations, and this knowledge is essential for the establishment of effective management strategies. A variety of research is conducted each year throughout the state that explores a variety of topics such has population dynamics, genetics, life histories, species interactions, wildlife monitoring technologies, and stock structure. Such projects are often conducted in collaboration with university, federal and international institutions. The results of these works are peer-reviewed and presented as written articles as well as presented at scientific conferences and meetings throughout the world. "NAPA North to Alaska" feature - smolt study on the Unalakleet River LRV"
Unalakleet smolt research. A general overview about the smolt study on the Unalakleet River in 2011. We briefly talk about the use of the screw trap, how the smolt are analyzed, and why the study is important. About 6 minutes. Produced by Dan Foster - ZONK! Productions Inc. and segment used with permission.